Old Sawmill District bridges Missoula’s historic past with its future through a vibrant mix of housing in all shapes and sizes, drawing together an equally vibrant mix of people from all lifestyles and stages. Young couples and families, professionals, empty-nesters, active seniors, and university students can all call Old Sawmill District home. EXPLORE what the neighborhood has to offer by walking out your door to enjoy a cup of coffee at The Dog & Bicycle Bakery Cafe. Find time for self-care at Brio Fitness, share a meal with friends and co-workers at the Sawmill Grille, or work productively at C3 WorkLounge, Missoula’s first premier co-working space. New commercial office and retail space provide an unprecedented opportunity for businesses seeking new construction in a true urban park environment. Within walking or biking distance of the city’s two largest employers—St. Patrick Hospital and the University of Montana—Old Sawmill District is already handily integrated into the fabric of Missoula’s workday. 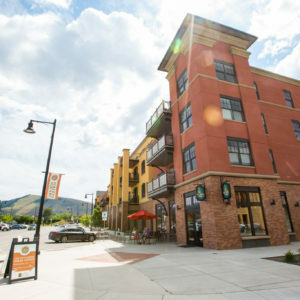 Polleys Square™ brings urban living to the heart of Missoula at Old Sawmill District™. Fabulous neighborhood and mountain views are abundant from the large windows and from your own private terrace. Open floor plans and high ceilings make the most of available space and create a warm, comfortable feel for your new home. Cambium Place is urban living infused with Montana’s wide open sensibilities located in the heart of the 46-acre Old Sawmill District with unrivaled recreational activities and entertainment options. A living experience for short- or long-term long residents. Cambium Place is also an inspiring workspace designed for companies wanting to recruit and retain a motivated and collaborative team. Coworking hinges on the belief that innovation and inspiration come from cross-pollination of different fields of specializations. Random opportunities and discoveries that arise from interactions with others – also dubbed ‘accelerated serendipity’ – play a large role in coworking. Designed for Missoula’s entrepreneurs, remote workers, professionals and thought leaders. Grow your business or pursue your own creative projects in our beautiful shared office spaces in Old Sawmill District. The Sawyer is student housing is designed with the modern student in mind. Located in Old Sawmill District, The Sawyer is a 52 unit, 213 bedroom pod style apartment building. Each apartment features fully furnished bedrooms with private bathrooms, a common living area, kitchen and washer & dryer. Students will be greeted with a variety of amenities including 1 GIG internet speeds, secure underground parking, outdoor courtyard space with gas fire pits and bbq grills, extra storage, bike racks and secure building access. 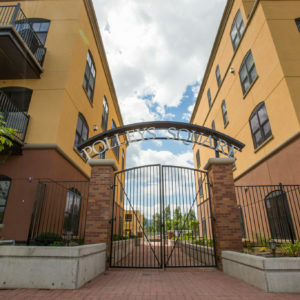 Meritage, an active living and learning residence, is uniquely located in Old Sawmill District and home to a place that empowers residents to achieve, fuller, richer, healthier lives in every way.